Nearly four decades ago, Ferrar (1979) described the larvae (all instars) and puparia of an undescribed calyptrate fly of uncertain familial assignment, widespread across southern Australia in forested habitats. The paper in question was a survey of dung-feeding Calyptratae (a diverse clade containing some of the most familiar dipterans, from the house fly Musca domestica to the tsetse flies [Glossinidae]) on the Australian continent, and the larvae of this undescribed species were accordingly coprophages reared from cow dung. While visually unassuming, the fly (the first specimens of which were collected by famed Australian dipterist D. K. McAlpine) was noteworthy for two reasons: first, in that it was larviparous (giving live birth), with females brooding single offspring at a time in lecithotrophic* fashion and depositing their larvae directly upon dung; and second, in that the fly could not be readily assigned to any known calyptrate family. While the flies have been reared only from bovine waste, this surely cannot be their original host association given that cows were only introduced to Australia two centuries ago. This is supported by the fact that adults have been collected in Australian habitats from which cows are absent (Michelsen & Pape, 2017). Ferrar (1979) did not describe the adults, but cited personal communications that they most closely resembled the Anthomyiidae, with male genitalia exhibiting "one or two characters" (Ferrar, 1979) more reminiscent of the Calliphoridae (blowflies), in this sense including both the Rhiniidae and Mesembrinellidae (now each having familial status; Kutty et al., 2010; Marinho et al., 2016). Ferrar (1979) concluded on the basis of both larval biology (sedentary and exclusively dung-feeding) and third-instar larval morphology (radiating slits around posterior spiracles) that "McAlpine's Fly", as it became known, could provisionally be considered an anthomyiid. Thereafter, adult specimens were bounced around to multiple fly systematists, each of whom concluded that whatever McAlpine's Fly might be, it was not in their respective taxa of interest (Ferrar, 1987) and thus apparently not worth describing. 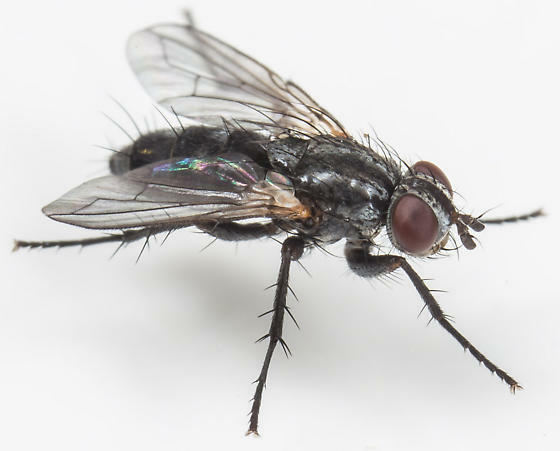 Nonetheless, its status as a valid taxon was never debated, and McAlpine's Fly was repeatedly referenced in the literature as an enigmatic footnote to fly systematics. The phylogenetic analyses of Kutty et al. (2010), using eight mitochondrial or nuclear loci, convincingly demonstrated (irrespective of model) that McAlpine's Fly was not akin to the Anthomyiidae, but rather a member of the superfamily Oestroidea. 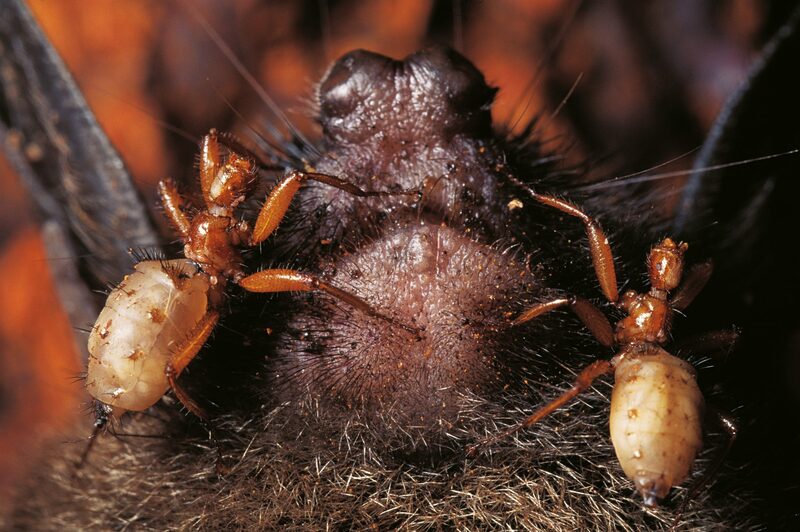 Moreover, a biogeographically intriguing sister-group relationship to the uniquely Zealandian, quasisocial† bat symbionts of the monotypic Mystacinobiidae (Holloway, 1976) was supported. Kutty et al. (2010) even suggested that the two lone genera could possibly be lumped in the same family, despite their great phenotypic dissimilarity. 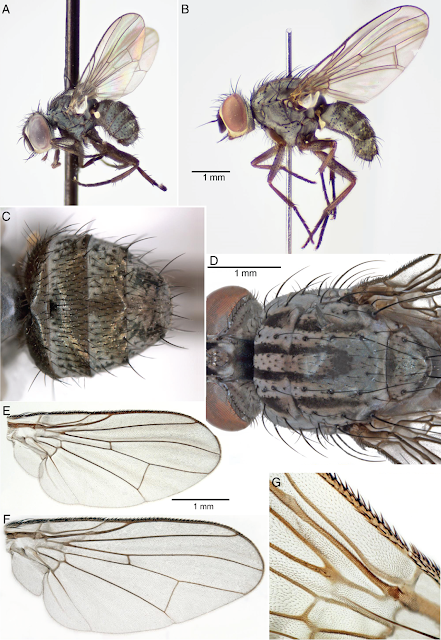 After four decades in taxonomic limbo, Michelsen & Pape (2017) have finally deigned to describe adult McAlpine's Flies in detail, under the name Ulurumyia macalpinei. As previously implied by years of placement incertae sedis, U. macalpinei indeed has none of the defining features that could assign it to any calyptrate family. Therefore, these authors establish the Ulurumyiidae for the species. Their description discloses a number of morphological traits that support this taxon's membership in the Oestroidea, although ulurumyiids lack both the distally bent medial vein characteristic of that superfamily (with the exception of some Tachinidae and Rhinophoridae) and a divided female sternite‡ VIII, a character state which in the Oestroidea is only elsewhere encountered in the Mystacinobiidae (Michelsen & Pape, 2017). While it seems entirely reasonable to place Ulurumyia in its own family, that family's phylogenetic position among the Oestroidea remains a topic of debate. Unpublished transcriptomic data hints not at a sister-group relationship with the Mystacinobiidae, but at kinship with the Calliphoridae sensu lato (Michelsen & Pape, 2017). Specifically, phylogenetic analysis of the Oestroidea suggests with medium to high support (disregarding model) a sister-group relationship between the Ulurumyiidae and Mesembrinellidae (Cerretti et al., 2017). While I do not find these results as compelling as I would like (read the paper), it is interesting that all Mesembrinellidae so far as known also practice larviparity (albeit of the pseudo-placental* variety; Meier et al., 1999). A very happy Boxing Day to you all. *Feeding exclusively on egg yolk, with the larva hatching from an egg within its mother. This contrasts with pseudo-placental larviparity, in which case larvae subsist on specialized secretions produced by their mother (Meier et al., 1999). The latter condition is a famed trait of the Hippoboscoidea. †Cooperative brood care among individuals of the same generation, without reproductive division of labor. ‡Ventral sclerites of the insect abdomen. Sternites are numbered according to the segment with which they are associated (antero-posterior). Ferrar, P. (1987). A Guide to the Breeding Habits and Immature Stages of Diptera Cyclorrhapha. Entomonograph, 8(1-2). Leiden and Copenhagen: Scandinavian Science Press/E. J. Brill. Kutty, S. N.; Pape, T.; Wiegmann, B. M.; and Meier, R. (2017). Molecular phylogeny of the Calyptratae (Diptera: Cyclorrhapha) with an emphasis on the superfamily Oestroidea and the position of Mystacinobiidae and McAlpine’s ﬂy. Systematic Entomology, 35, 614-635. Marinho, M. A. T.; Wolff, M.; Ramos-Pastrana, Y.; de Azeredo-Espin, A. M. L.; and Amorim, D. S. (2016). The first phylogenetic study of Mesembrinellidae (Diptera: Oestroidea) based on molecular data: clades and congruence with morphological characters. Cladistics, 33(2), 134-152. Meier, R.; Kotrba, M.; and Ferrar, P. (1999). Ovoviviparity and viviparity in the Diptera. Biological Reviews, 74, 199-258. Michelsen, V. and Pape, T. (2017). Ulurumyiidae-a new family of calyptrate flies. Systematic Entomology, 42(4), 826-836.